There I was, sleeping the sleep of the just, all snuggled up in my blankets against the unseasonable Florida cold, while Wife Lila was on her way to church. About six minutes before my alarm was supposed to go off (so I could ignore it, being Sunday and retired on top of that), my cell phone rang. For a guy who used to be a telecommunications manger, I hate phones in general and cell phones in particular. I swear they have a sensor that makes them ring when I’m napping, in the shower or in the one-seat Steinhoff Reading Library. Oh, yes, I can go a week without getting a call, but let me be on my cell and that will compel the house phone to ring, not wanting to be left out of anything. So, back to this morning: Wife Lila says she’s in a no-parking zone on the northbound lane of Parker Avenue north of Forest Hill with a blow-out. While I’m trying to find garments to cover my body, she calls back to tell me that the sidewall is wrecked and that blowing it up is not an option. “That’s the way blowouts work,” I said. I assure her I am on my way. I stop long enough to get a manly tire tool and a heavy hammer in case some gorilla with an impact wrench put the tire on the last time. I head south on Georgia, turn west on Forest Hill (to be passed by a plain black pickup truck with emergency lights running Code 3), go past Garden, Lake, Parker, I-95 and a myriad of other streets until I get to Congress, and drive north looking for Wife Lila’s green Honda Odyssey van. Three blocks north of where she should be, I pull into a parking lot, pick up my cell phone to find out where she is. Just as I press SEND, I realize I’ve driven to CONGRESS and Forest Hill, about a mile past Parker. I confess to a brain fart and assure her I’m on my way. I make a U-turn (unlike Ohio, U-turns are permitted unless prohibited), head back east on Forest Hill Blvd. and turn north on Parker, where she is supposed to be. Six blocks later, I pick up my cell phone to ask her where she is. “Oh, I’m not on Parker, I’m on Lake.” That’s a block east of Parker. I assure her I’m on my way. Yep. The tire was definitely flat. Something had done a real number on the sidewall. I bounced the doughnut spare on the ground a couple of times and thought it was in pretty good shape. I should have checked it with a tire gauge, then topped it off with the portable tire pump I bought in Cape last summer. This isn’t exactly the model I have, but they are all about the same at this price point. Four of the five hub nuts spun off easily. Gorilla guy put on the fifth one. I had to resort to The Big Hammer to break it loose. Home was only a few blocks away, so she drove it to where I could get at it with my electric compressor. She’ll go over to Southend Service in the morning to get a new tire. Luckily it was one of the older ones. Your nap time will go smoother if you give Lila a membership. You said you made a couple of tactical errors, but the biggest error you made was not belonging to an auto club as Mark S. suggests. Then Lila could have used the dreaded cell phone to call a professional. A much younger person than yourself with the proper tools would have come to her rescue while you slept, as all retired 60-somethings are entitled to do until they wake up organically. Bald-headed old men with plumber’s crack shouldn’t be doing actual labor when alternatives are available. I just give thanks that Lila didn’t take the picture of you from behind. Auto club employees don’t take pictures for a living, so you shouldn’t be trying to do their jobs. I was a AAA member for about 30 or 35 years, mostly for their maps. It was convenient to be able to parachute into a town and get local maps to help find my way around. When my annual family dues were close to a hundred bucks, and GPS technology came along, I decided I didn’t need their maps. 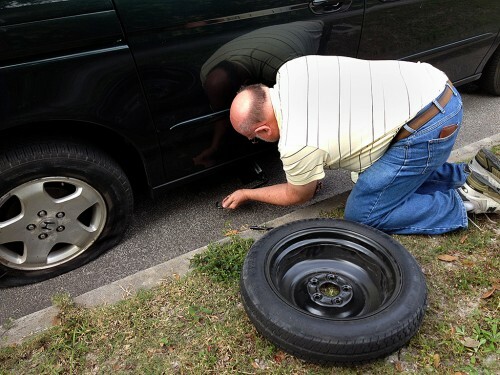 The final straw was when Matt had a blowout and spun out on the Florida Turnpike. 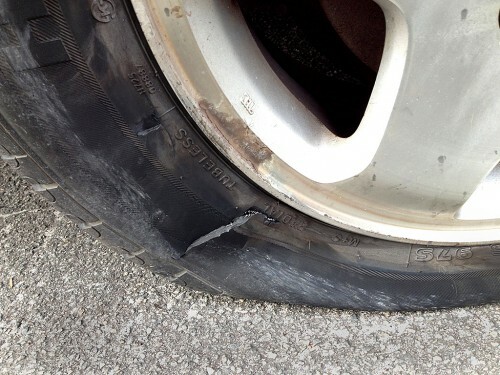 AAA said he was “too far off the road” to qualify for a free tow. I also haven’t like some of the anti-bicycle stands they’ve taken over the years. 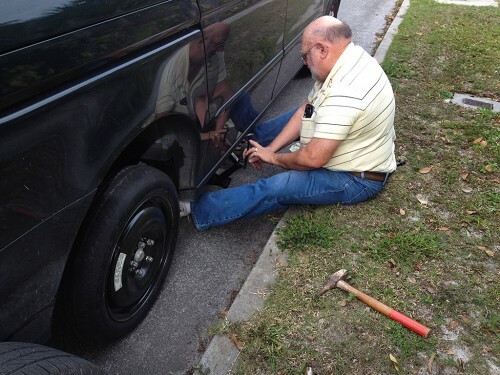 Bottom line is that I can still change a tire; I have a spare; I have a portable compressor; I carry two sets of keys, so I don’t need anybody to open the door for me, and I have a GPS and wireless devices that are more up-to-date than their maps. And, I’ll have you note that there is no plumber’s crack evident in those photos. It’s all I can do not to comment about your spare tire. I hear a pot calling a kettle black. Yes, I’ll concede that I have a regular-sized spare tire, but I believe you are carrying a doughnut version yourself. Yes, getting road side assistants is a smart move. 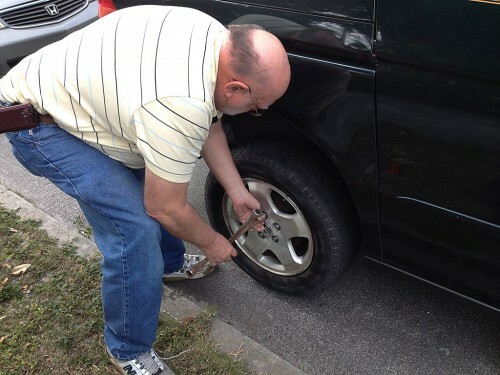 I always thought it was expensive until my daughter had her second flat tire. The first one I drove about 100 miles to only have to drive back home as a state trooper changed it for her. The next one was at her work in St. Louis and we live in Cape Gir. I am still kicking myself for not getting it a long time ago. We even had them to add it to our sons car as he had to have his towed in for repairs and was out the tow bill. would have bee way a lot cheaper to pay for the road side assistance.